A one-person art exhibit by Sue Clancy titled "Purrsuits of Pleasure." 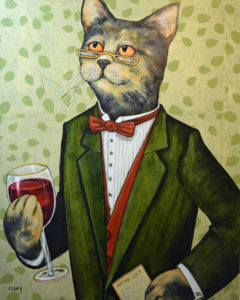 The exhibit focuses on cat characters delighting in local pleasures. Clancy got the idea from noticing that her cat seeks pleasure without shame.